The Maker Scouts is a weekly scouting program for young children (4-10) who are ready and interested in Tinkering and Making with different materials and tools. 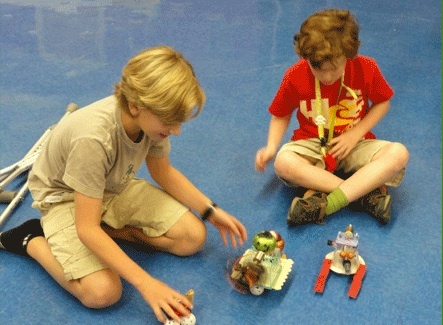 The Maker Scouts program provides young Makers learning opportunities in STEAM [Science, Technology, Engineering, Art, and Math] education through four 12 week sessions, each of which focus on critical thinking, design, and building with hand-on activities. Activities are designed to help the youngest makers become safe, proficient users of making tools and materials on their way to discovering their passion and language of self expression. The program also provides young people learning opportunities that foster the core values of the Innovator Mindset– embracing failure, frustration tolerance, communication, collaboration, creativity and empathy. Maker Scouts MAKE robots, sew upcycled clothing , play with circuits, invent games, use e-textiles, build with wood, metal, plastic, make cardboard creations, play with food, tinker with real tools, shoot off rockets, invent real world solutions to real world problems and so much more. For older kids, a sister organization called Hacker Scouts is available. My hat is off to everyone involved in these organizations. STEM jobs are growing so fast that employers often can’t find people to fill them. And even kids who don’t grow up to work in a STEM career will benefit greatly from the critical thinking and problem-solving skills that STEM activities build. Working with kids can be challenging, but we owe it to them to give them every opportunity we can to stretch their minds and build stuff. Maker Scouts is just getting started, so give some thought to how you can help them in your area!